“Climate change is a global problem and we need an international solution,” said Kassie Siegel, lawyer and director of the Center for Biological Diversity’s Climate Law Institute, to an impassioned audience of students, faculty, and community members who gathered to hear her views on environmental law and the best ways to combat climate change. The October 15 event was the first of this year’s human-animal studies (HAST) lecture series, co-sponsored by Campus Diversity and Inclusion, The Stauffer Center for Science, Mathematics, and Environmental Studies, the Johnston Center for Integrative Studies, and the Philosophy and Environmental Studies Departments. Siegel, who was named a top California lawyer in 2010, develops and implements campaigns for the reduction of greenhouse gas pollution and the protection of wildlife threatened by global warming. She has litigated under a number of environmental statutes and was the author of the 2005 petition approved by the government to place polar bears on the endangered species list. 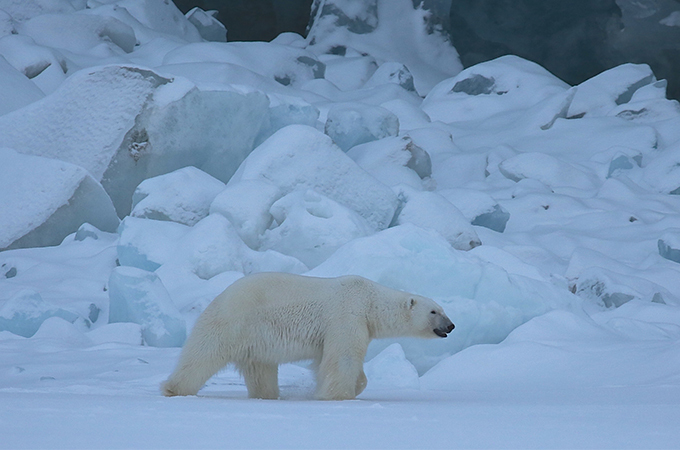 Focusing on the protection of endangered polar bears, Siegel explained how greenhouse gases and other environmental factors contribute to the rapid warming of the planet. The burning of fossil fuels and industrial agriculture are quickly changing the concentration of gases in the atmosphere, causing a rise in temperature. When the sun warms the earth, some of the energy is radiated back into outer space and some of it is captured by greenhouse gases in the atmosphere and then reradiated onto the planet. Using research-based studies and scientific evidence, she noted that the global temperature is rising twice as fast than average in the Arctic, causing a sharp decline in the polar bear population. On the state level, while California’s oil and gas production is largely centered in Kern County—just north of Los Angeles—the industry also affects inner-city populations. Siegel’s team partnered with the South Central Youth Leadership Coalition and Communities for a Better Environment to sue the City of Los Angeles over neighborhood oil drilling. As a result of an energy plant and oil drilling site in South Central Los Angeles, many children in the neighborhood experienced daily nosebleeds, nausea, and dizziness as a result of chemicals in the air, Seigel contended. People can begin to make a change by getting involved in local measures to ban fossil fuel production. Initiatives that oppose fracking, such as Measure G in San Luis Obispo County, will protect miles of wilderness, a variety of animal species, and the area’s population.